It is official. Winter has arrived. Yes, we feel the bite of winter’s freezing hands down south here in Alabama too. But I am not as dismayed with the season as I was last year. Nausea all alone in the house was not fun but what is fun is having a home full of people and a kitchen that is always bustling with activity, be it something as simple as making a pot of tea or Amma rustling up wholesome South Indian food! One of the best things about my mother-in-law is her innate talent of creating something nutritious with fresh flavorful ingredients. Since Appa has a strict diet regimen, her choices when it comes to selecting vegetables is very rigorous. If you are one of those people who thinks that a diet that revolves around healthy cooking (low oil, lots of green leafy veggies kind) is snoozville, I am very sure that Amma’s cooking will change your mind. This week’s bounty hunting at our local ethnic market brought to us some beautiful bunches of green onion. Now, this is not a vegetable we generally use in Indian cooking. Or so I thought until our trip to Indian last year. The day we landed in Madras, Amma cooked up some Sambar with green onions which found a huge fan in me. I would not be exaggerating if I said I had dreams about it until last Sunday. And then I found a new green onion dish to haunt my dreams: the Green Onion Kootu. Although She laughed at me when I said I was going to write about it on the blog next, she agreed that it was a dish that connoisseurs of Indian food should taste! So after hurriedly clicking pictures of it, I decided that this Kootu deserves a big reveal as soon as possible. With the weather turning all frigid on us, I deemed this the perfect timing! 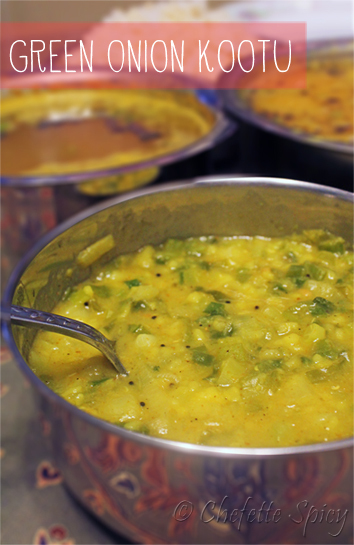 Cook the green onions and Mung Dal with enough water, turmeric powder, Sambar powder and salt. 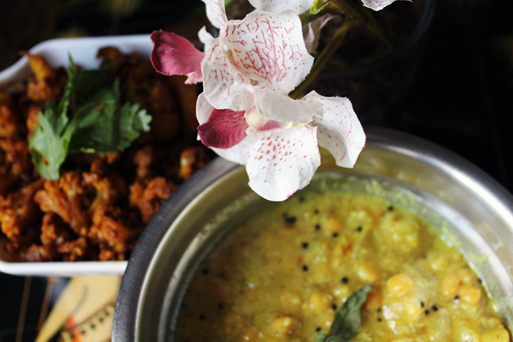 When done, temper with mustard seeds, Urad Dal, asafoetida and curry leaves. If you are serving it as a side, make sure it is thick (thicken with AP/corn/rice flour). This dish could also be served as a soup. Squeeze half a lime and make some Papads (or cut a fresh loaf of bread) to dunk into the soup. Since we made it for a casual lunch, we left out the cilantro for garnish. You could go ahead and dress it up. Be safe, y’all! I heard it is going to be a messy week. Categories: amma, Chennai, Food, Healthy, Indian, Kootu, Recipe, South | Tags: amma, Chennai, dal, green onion, healthy, kootu, scallions, soup, wholesome | Permalink. This has got to be the stupidest post I’ve ever written but it is inevitable. I haven’t cooked anything interesting since my last post. I am not motivated and food turns me off. It’s a phase. And you probably guessed the reason too. I’ve been struggling to keep up with the idea of food and cooking. It is especially painful when you live away from family, with a man who would do anything in this world for me but cook. Let’s not blame him because even if he did cook, I would not want to eat it. Aversion to things I love eating has been following me around. I crave Indian food, especially that are not all that nutritious for you like Dahi Puri, Kashmiri Naan and things there is no way in hell I can find in remote Alabama. So, I totally cannot wait to get to India in December. Once there, my mommies will cook for me, I will go out to eat with friends and family and feel loved. Until then, I have to trudge through coursework, housework and make sure I stay sane. No, don’t feel bad for me. This will keep my endurance in check. I was talking to K today about the sad state my blog is falling into and he suggested I dig into my folders to find food that haven’t posted about. I did. And it turned up some badly composed pictures. But desperation has left me with no choice and I hate picture-less posts. 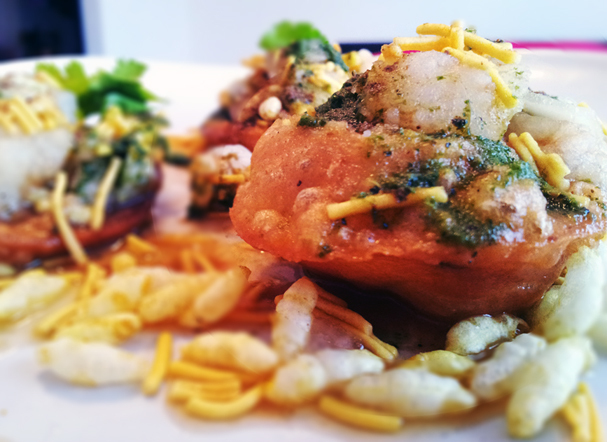 so this here is Bhel Puri, a more popular cousin of Dahi Puri that I crave. I made this in March and I refused to make it again because it made me miss home more. This is Knolkol/Kolrabi Kootu and Curried cauliflower. This Alabama is a strange place. We have a multi-ethnic store which stocks a traditional Indian vegetable like Knolkol but hardly sells eggplant. This Kootu is made of coconut, cumin and Thai chili. If you do find Knolkol in your store, I need to warn you though. Select smaller, tender ones because it is a very fibrous root. It takes extensive peeling and cooking to make this tuber edible. But its taste is unparalleled and this is why I go through all that trouble. Grind the coconut, cumin and Thai chili together with a little water. Cook the Knolkol until tender. Discard excess water, mix in the paste and salt. Let it boil for a few minutes until you get a semi-solid consistency. Optional addition is soaked Bengal Gram Dal. Two Tbsps soaked overnight (or in hot water for 10 minutes). Add to the cooked Knolkol with the paste. Tada! So this space is probably going to be done with originals. I will keep it alive with things I eat outside, things my mommies cook up for me and general India posting (sans the Slumdog Millionairesque pics). Who wouldn’t like that! Categories: City lights, Food, Hello, India, Indian, Indian, Kootu, Marriage, Musings, Recipe | Tags: amma, chat, craving, india, Indian, knolkol, kolrabi, mom, mommies | Permalink.